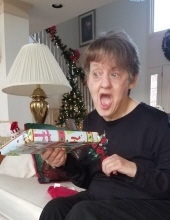 Helen Patricia Drake, age 64 passed peacefully Friday Feb 8th, 2019 at Ascension Providence Hospital Southfield Mi. Helen was born on December 15 1954 in Hazel Park MI but resided and grew up in Detroit MI. Helen was born developmentally disabled and was lovingly cared for at home until she was 20 years old. Helen moved to the Brewer Group home where she has lived since 1992. Helen will be remembered and missed as one who brought joy to others. She loved life, people and especially music. May the choirs of angels welcome a new member into heaven. "Email Address" would like to share the life celebration of Helen Patricia Drake. Click on the "link" to go to share a favorite memory or leave a condolence message for the family.